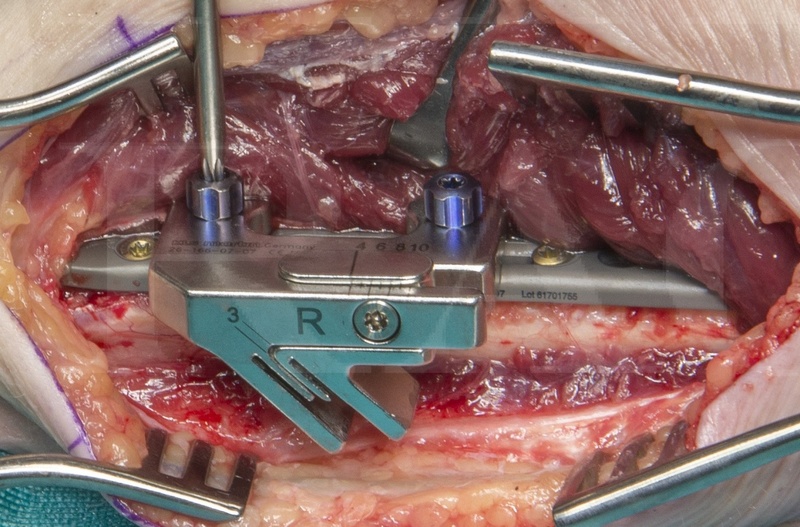 Learn the Ulnar shortening osteotomy using the RECOS locking plate surgical technique with step by step instructions on OrthOracle. Our e-learning platform contains high resolution images and a certified CME of the Ulnar shortening osteotomy using the RECOS locking plate surgical procedure. An ulnar shortening osteotomy is a common procedure in wrist surgery and was originally described by Milch in 1941 for the treatment of an ulnar positive variance following a distal radius malunion. Currently it is performed for a variety of indications and although these may demand different degrees of shortening, the same techniques and instruments may be used to ensure a high degree of precision and control. Recent years have seen a number of manufacturers introduce specialised instrumentation and customised plates. In this section I describe one technique of ulnar shortening using the RECOS (KLS Martin Group, Germany) locking reconstruction system for ulnar shortening. This is a pre-contoured titanium plate with drill sleeves and colour coded screws. It is one of a number of similar ulnar shortening plates used at our institution, and has a very limited number of instruments required. It is consequently one of the simpler procedures to follow.